2019 Honda Accord LX CVT 1.5 Touring. Lease for 36 months at $180 with $2,000 down payment Stk#190854 Vin#KA048422. 4-Cyl Engine., 4 Dr., Auto, P/S,B,W,L,M, AC, Airbags, Bluetooth Connect, Backup & lane watch right side camera, Abs, CD/MP3, MSRP $ 24,640 Total due at inception $3,144 includes. $2,000 down payment, $0 Sec. Dep. 1st Mo. $180 payment, $595 acquisition fee; and $369 documentary fee. Total lease payment = $6,480 Residual. $14,358. Lessee responsible for maintenance, excess wear & tear. 10,000 miles/$.15/mile thereafter. Price(s) include(s) all costs to be paid by a consumer, except for licensing costs, registration fees, destination and handling and taxes. 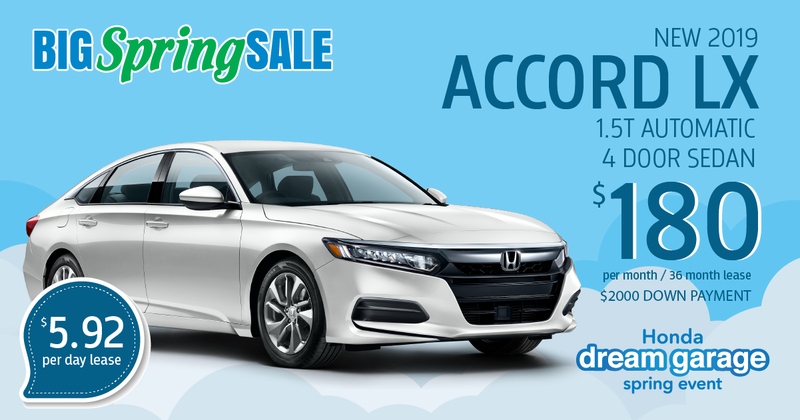 Special APR offer valid on new and unregistered 2019 Honda Accord LX models from 4/3/19 through 4/30/19 To well qualified buyers on approved credit by Honda Financial Services through participating dealers. Must take new retail delivery on vehicle from dealer stock by date, 4/30/19. Not all buyers may qualify. Higher rates apply for buyers with lower credit ratings. Dealers set actual prices. See your Honda dealer for details. Closed end lease based on # mos. Avail to customers who qual. For AHFC Super Preferred & Preferred credit tier Vehicles shown are for illus. purposes only. The ad supersedes and cancels all publ. and non publ. advertisements. Not responsible for typos errors or omissions. *Based on 2018 EPA mileage ratings. Use for comparison purposes only. Your actual mileage will vary depending on how you drive and maintain your vehicle.